O Mary, by your visit to your cousin, Saint Elizabeth, you joyfully spread the good news of the coming of Jesus into the world. May many young people generously follow your example, and give their lives totally to the service of your Son as priests, brothers and sisters. O Mary, ever since the wedding feast of Cana you have always been the powerful help of all those who have asked your aid and protection. By your prayers, keep me free from all dangers and help me always to rise above my faults and failings. O Mary, by your presence at the foot of the cross, you comforted and strengthened your son as he offered his life to the Father. Be with me at the hour of my death, and lead me quickly to the joys of your Son’s kingdom in heaven. O Mary, by your presence in the upper room you strengthened and encouraged the apostles and disciples as they waited for the coming of the Holy Spirit at Pentecost. May I always be open to the gifts of the Spirit, and may my faith always be deep and living. O Mary, throughout her long history you have always defended your Son’s Church from the attacks of her enemies. Be with her again in our days. Help each one of us to be her loyal subjects and to work without ceasing for that unity of peace and love for which your Son so fervently prayed. O Mary, you have always been the special guide and protector of Saint Peter’s successor, the Bishop of Rome. Keep our present Holy Father in your loving care. Defend him from all harm and give him all those gifts he needs to be the faithful shepherd of your Son’s flock. 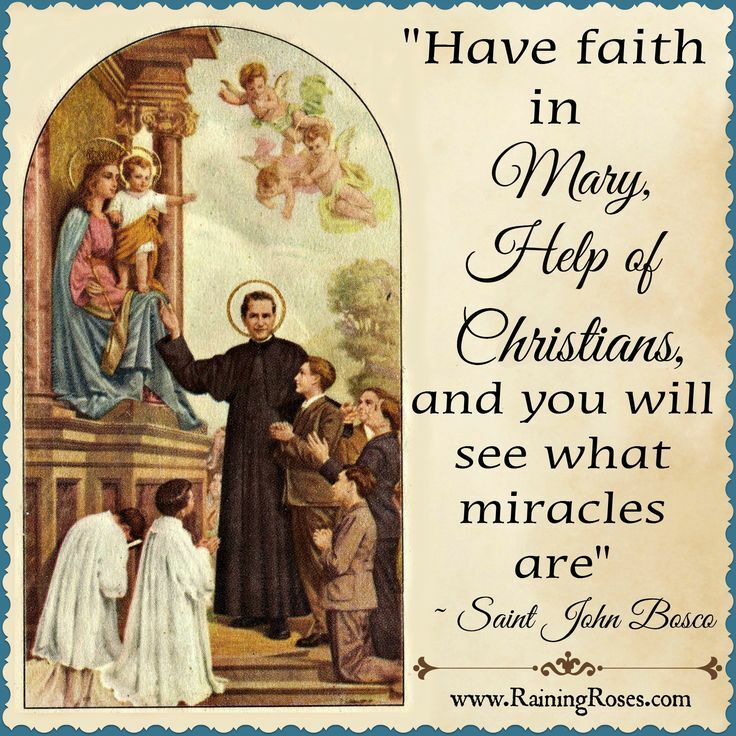 O Mary, the wonderful way you helped Saint John Bosco’s work to grow and spread shows that you have a great love for the young. As you watched over the child Jesus at Nazareth, so now watch over all young people, especially those most in need, and help them to grow daily in love of your Son.